“Yes, absolutely,” is the honest response of recalled Scotland centre Mark Bennett when asked, slightly tongue in cheek at yesterday’s press conference, if ‘a little part of him had died inside’ watching Huw Jones take to the Scotland midfield like a duck to water. The Stormers centre has been the find of the autumn with two scintillating performances in the first two Tests against Australia and Argentina but a foot injury keeps him out of tomorrow’s match against Georgia in Kilmarnock and leaves him with a challenge to recover in time for the Six Nations, which start on 4 February. “That’s the competition that’s there,” said Bennett, who reclaims the No 13 jersey. “The hard thing is when you’re watching it happen and you’re not playing yourself. The 23-year-old Glasgow centre has been finding his way into the season following his decision to play for Great Britain’s sevens team in the Rio Olympics. That worked out well with a historic silver medal around his neck but it also left a door open in the Scotland set-up, which Jones made the most of. “The competition in the squad is huge, going away to Rio when the team were in Japan meant there was the opportunity for someone else to have that chance. “Huw was given the chance to stake a claim and that’s what’s happened. “I need to do my best this weekend to do well and take that jersey back. The emergence of Jones has added even more depth to a position that has seen a plethora of high-quality contenders make their mark in the last couple of years. “It’s clear to see there’s a good group there at centre,” said Bennett. “There are five or six boys who can play and any of us could start. “It’s about going out and playing well and this weekend is no exception. “It’s become more competitive week in, week out. There is a real fight at training to stake a claim as the coaches are watching when they are picking a squad. 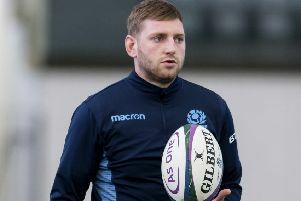 The proud Ayrshireman is looking forward to playing at Rugby Park after missing the only other Test played there, against Tonga in November 2014, when he pulled a hamstring against New Zealand the previous weekend. The Cumnock man was schooled at Kilmarnock’s St Joseph’s Academy and he is hoping to do the home county proud tomorrow afternoon. “It would have been great to play at Kilmarnock [two years ago] but I’m getting my opportunity now. I’m really excited. I was down at Rugby Park yesterday and it will be cool to go back home,” he added. “I was there for that Tonga game, just in the crowd cheering the boys on. “I’ve got a good group coming along to support on Saturday – it’s just round the corner for a lot of them. Bennett encountered a few Georgian players when he spent a loan period at Vern Cotter’s old club Clermont Auvergne as a youngster and knows what to expect from the abrasive east Europeans. “Yes, I played with [blindside flanker] Vito Kolelishvili. He’s mental,” said Bennett with a smile. “A big strong lad, a physical man, and just a little bit crazy. “It will be good to catch up with him after the game, but I’ll be trying to avoid him as best I can on the pitch. “He is one of the nicest guys you will meet off the pitch, but on the pitch you don’t want to cross him. “We know we are going to have to be physical with him and try to nullify that side of their game so we can dominate as we want to. We can’t go in thinking that it’s going to be an easy game. Bennett said there was fierce determination in the Scotland camp to finish the series off with a win. “We had a great performance against Australia but didn’t quite win, and then we got the win against Argentina,” he said. “We just want another now, get back-to-back wins, and move forward from there.